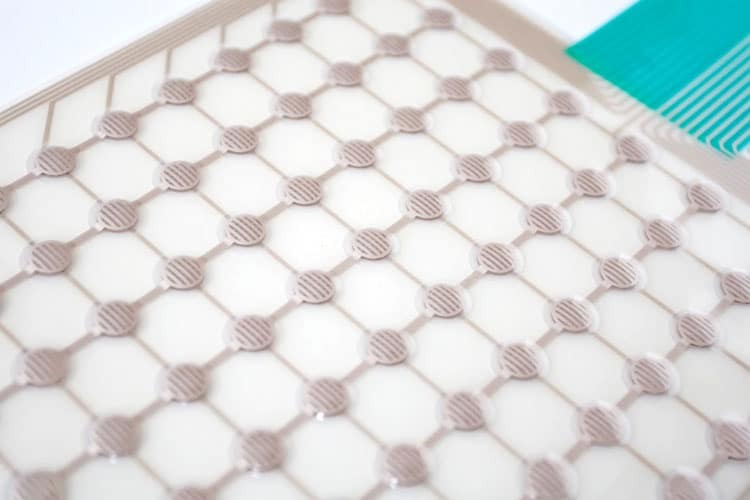 A polyester dome membrane switch gives you the ability to design high density membrane keypads at a lower cost than a traditional metal dome membrane switch. Formed during a single stage thermal cycle, polyester dome membrane switches are three dimensional tactile buttons formed of molded PET. You specify the actuation force of your polyester dome membrane switch. Actuation force is determined by switch geometry which can be reliability manufactured at tight tolerances from prototype through high-volume production runs. The ability to tightly control the actuation force is a unique quality of a polyester dome membrane switch. The range of actuation specification is much wider than can be supplied by a traditional metal dome membrane switch where actuation force is determined by standard metal dome under-pads. An electronic interface using polyester dome switches delivers a much quieter experience. A polyester dome membrane switch lacks the “click” sound delivered by metal dome switches. This makes polyester dome membrane switches ideal for noise sensitive environments such as hospitals and recording studios. To hear the noise level at actuation, request your polyester dome membrane switch sample packet. Unsure if a polyester dome membrane switch is the correct solution for your application? Submit your design for a free engineering review for your membrane switch. Your purchase order is always welcome. For your convenience we take additional methods of payment. Our sales team can answer questions about our order process and forms of payment.